Remember orange creamsicles? I LOVED them as a child, and was reunited with the memory at the Jersey shore a few weeks ago. Fantastic mixture of vanilla custard and orange sherbet. 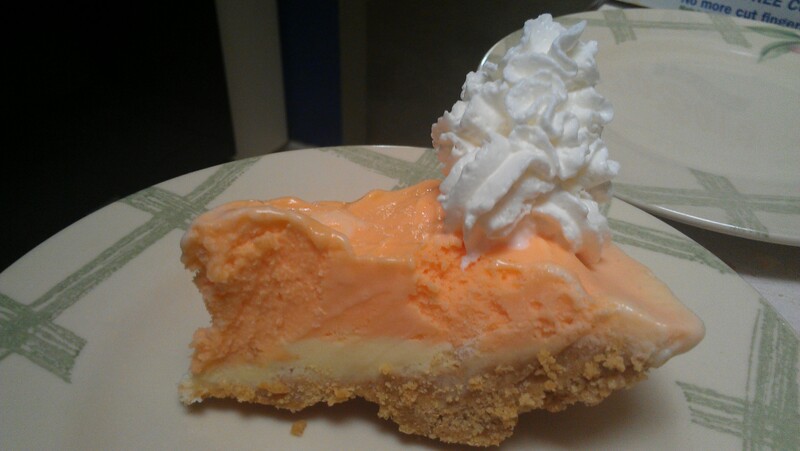 Here’s an idea to make your own creamsicle pie for dessert tonight. Make a pie crust from graham crackers and butter. About 1 1/2 cups graham crackers crumbs and 1/2 stick of melted butter or margarine mixed together and flattened into a pie plate. Bake the pie crust in a 375 degree oven for about 7 minutes – just enough to set it. And then let it cool! 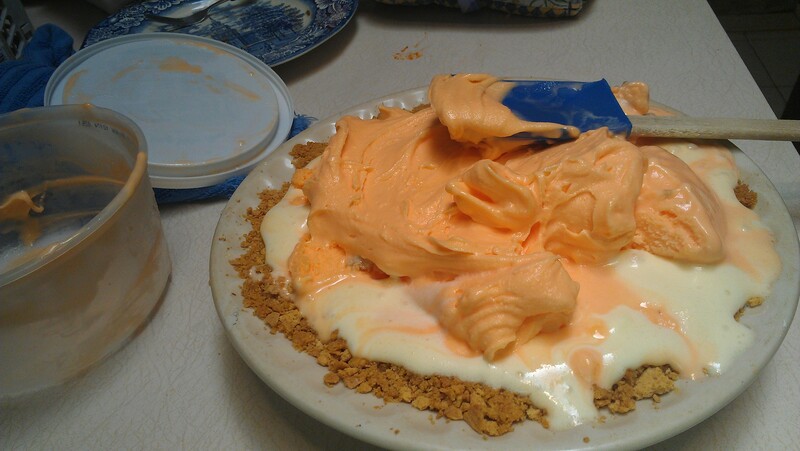 While the pie crust is baking and cooling, take some vanilla ice cream and some orange sherbet out of the freezer. A 2:1 ratio is my favorite – 2 pints of orange sherbet for 1 pint of vanilla ice cream. Let them get soft, but not completely melted. Just soft enough to spread, like peanut butter, into the crust. Pop the whole thing in the freezer to hard set for about 2 hours or more. Slice, squirt of whipped cream. Voila! Dessert that will make you feel 7 years old again! 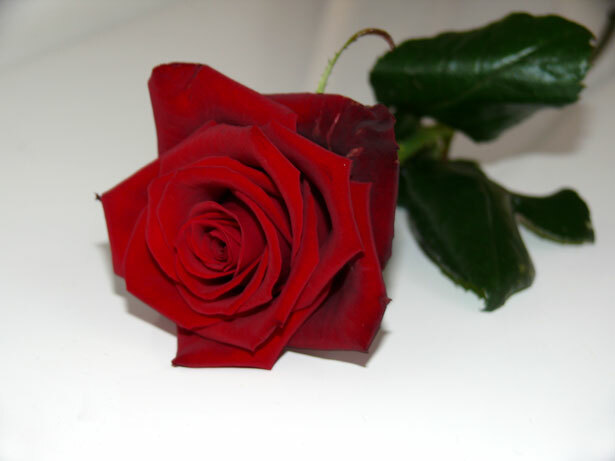 Rosees? Chocolates? Or do you give your partner what s/he really wants – time. Here are a dozen inexpensive date ideas to make give you and your partner the chance to spend some time together. Check the Star Ledger for a local concert in a smaller, more intimate setting. Buy two cheap canvases and finger paint. Build a fire, snuggle up, and read a book of romantic poetry together. Take a picnic lunch and go to a lake to feed the ducks. Select a new recipe. Shop for the ingredients and prepare dinner together. Get a little fancier than usual. Make a recording of the loves songs you both like and play it while driving in the countryside. Go for a hike. Some great Union County parks can be found here. Rent a new movie and make popcorn. Take a trip to NYC and visit the museums. Go on a wine or brewery tour. See a matinee for less than a movie in the evening. Go to a coffeehouse, sit in giant comfy seats, and sip lattes. Rub the chicken breasts with olive oil and place them on a baking sheet. Season with salt and pepper. Roast the chicken for 35 to 40 minutes, until just cooked. While the chicken is roasting, saute the onions in a Dutch oven in olive oil over medium-low heat for 10 to 15 minutes, until translucent. Add the bell peppers and spices. Cook for 1 minute. Crush the tomatoes by hand and add to the pot with the basil. 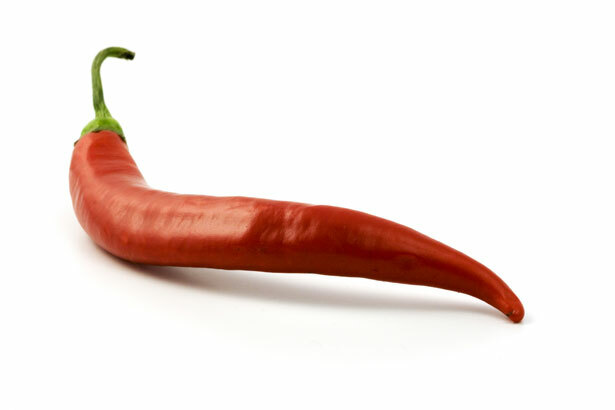 Bring to a boil, then reduce the heat and simmer, uncovered, for 30 minutes, stirring occasionally. Remove chicken from the oven and let it cool slightly. Separate the meat from the bones and skin and cut it into 3/4-inch chunks. Add chicken and beans to the chili and simmer, uncovered, for another 20 minutes.